One of the best things about having a mama-to-be BFF is it gives me a chance to bring out me party planner-obsessed self! Baby showers are my absolute fave, and I just can never get enough of the cuteness of every single thing we made for my friends party. It was the ultimate, bestest, most perfect elephant baby shower for a boy that I’ve ever made! I guess I have to style another one soon to check if it can top off this event we had last Saturday. 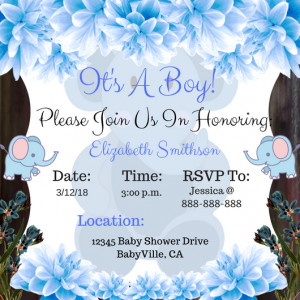 I know you’re just as excited as I am to get those creative juices flowing and get straight to work (edit: play) with all the fun stuff about an elephant baby shower. So let’s check out how I transformed my friend’s home into a SUPER fun party scene as I share with you all the cool details for this event. First thing you gotta work on are the invitation cards since you need to send these out at least a couple of weeks prior to the party. I mean, your guests don’t just sit around at home, right? They have schedules, and you want to make sure they can block out the date when you’re throwing the party. So for the cards, since we’re doing a blue elephant baby shower, they HAVE to have these super adorable creatures on there. I personally like Lumpy from the show “My Friends Tigger and Pooh”. I mean, he’s blue, he’s super fat, and is a ton of cuteness! So you can choose your character in mind if you want, maybe go for Lumpy or Dumbo or a random blue elephant that you like. It gets a little tricky, though, since there are dozens shades of blue, and you don’t want it to end up like a bunch of darks and lights and everything else in between. I suggest that you get your invitation and thank you cards from one source to make sure you have just one shade of blue for your cards. 2. Balloons, Banners, the Works! I love balloons! They’re just super festive and really gives out that party vibe. 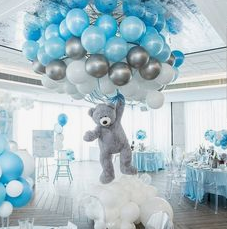 So I knew this baby shower just gotta have balloons – and a ton of them! My friend’s yard has a bunch of nice big trees, so I tied the balloons on some of the branches, and some I tied on her lamp posts. I like how her yard looked so fun with these adorable blue balloons, and I tied silver swirly bows right at the bottom of the balloons to add some sparkle in them. It totally rocked! Then I had a blue banner with Lumpy on one end shouting out “It’s a BOY!” I had this placed on the her door, so everyone can see it and get into a party mood straight out. There were also blue and silver streamers right above the door! Now, the centerpiece is called that way for a reason – people see this first thing when they enter the room. So ladies, I gotta stress how uber important your centerpiece is, so make it super awesome! I like to stick to the classics when it comes to the centerpiece, so I made a 3-layer diaper cake and put a Lumpy plush toy on top. You can turn it into a 6-layer cake if you want! But I figured 3 layers is perfect, otherwise, it’ll be too tall for everyone to see the top. LOL. I put small-ish mason jars with peanuts around the cake, which are actually the party favors doubling up as decor for the treats table. Will tell you more about these cool stuff in a bit! Any party is NEVER a party without your goodies! I went for bite-size finger foods for the treat since it’s a tea-time party, plus I know the ladies are watching their waists! Didn’t really want to be put to blame for an extra 200+ calories at the end of the party. Now what did I dish out? Super cute and yummy (and hip-friendly) goodies, of course! Well. at least that’s what I assume since they’re bite-size. But grab a dozen of these, and you wouldn’t wanna sit at the dinner table to stuff that huge meal down your tummy! 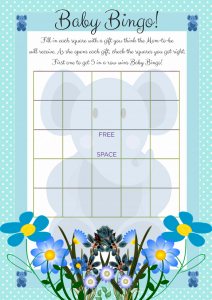 From Baby Bingo to Diaper Designing Contest and Guess How Many, games simply add a ton of fun to your baby shower! So you have a big jar full of peanuts on the table, and the goal is for your guests to guess how many peanuts are in there. Yeah, tough game, but it’s pretty rad watching them stare and count the peanuts with their eyes! Unless they’re psychic or they were the ones who put the peanuts in there themselves, it’s pretty hard to guess the exact amount. So you can give it to the one with the closest estimate. Before your guests walk away, be sure to hand them your super cute party favors as tiny mementos for the day’s event! I like giving consumables because they’re easy to make and very practical. I know what you’re thinking, ladies – tea lights are perfect for those “pamper me” nights. In a nice blue box, maybe with glitters or some other designs, neatly arrange your tea lights. Then tie a blue or silver bow around the box and voila – your dainty tea light delights party favor is good to go! Yeah, cookies are not exactly hip-friendly, but you can always ditch your double choco fudge cookie with a healthier and low-cal oatmeal cookies! 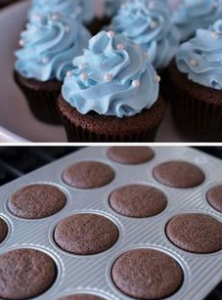 Just place these in a mason jar, close the lid, tie a bow, PERFECT. Or put a bunch of peanuts in there for an even healthier snack food option! This is not a party essential per se, but it’s a party must-do! You start with a theme, which means you have to line up the basics such as the color (in this case, it’s blue) and the elements for this elephant baby shower. So make sure everything matches – from the invitation, thank you cards, food, games, and decor. You want your party decor to be cohesive and really sticks to the theme. Maybe a month ahead, you should scout some cool sources for your materials and decor since you need to do a lot of planning and decorating the day before the event. You can ask for recommendations for the best resource for your party needs. 8. Make Sure It All Matches! Like I said, blue comes in different shades, and one way to ruin the party decor whether you’re OC about it or not, is by having light blue, dark blue, medium blue, and weird shades of blue all mixed up! Really an eye sore, and it just doesn’t work, ladies! So if you’re buying your decor and party essentials, be sure to get it from ONE source. This way, you’re sure that everything matches, plus it’s easier for you, too. No more looking around for 3, 4, 5 places to get your stuff. You don’t want the extra stress. That is what we have aimed to provide here at ElephantBabyShower.com. We have created an adorable full set of everything you need for your baby shower at an extremely competitive price! Please click here to see everything that is included. I’m pretty much OC about everything, including the parties I style. So yeah, I want it to have an organized and pro feel, which I can surely get from getting a complete set of items for the party. I look for a set of invitations, game cards, and other decor elements from a trusted source. 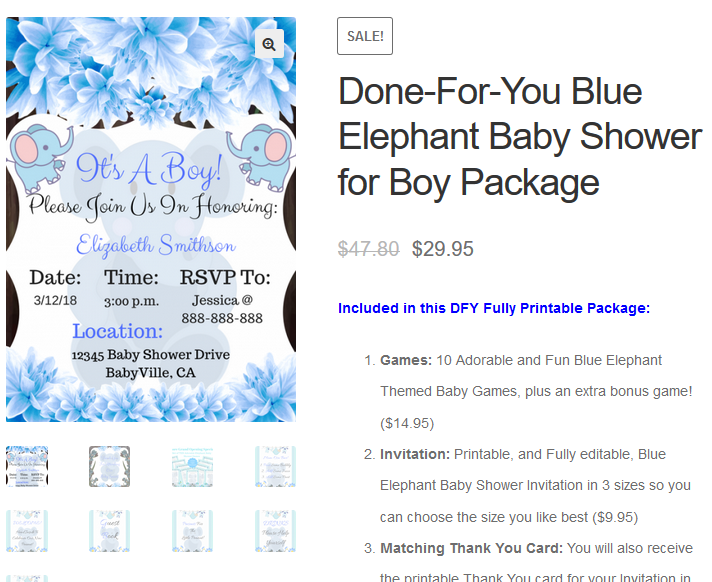 Good news for me – and for you – there’s one that specializes in elephant theme baby showers, so they’ve got just what you need! No more confused and messed up look for your party. One added perk of buying a complete set is that it eliminates the extra work for you. The designs are professional, and they’re ready to use. Just put it up or place it on those spots in the house where you want to use them, and you’re done! Never end the party without the scrapbook signing by the guests! So you have your blue scrapbook with elephants on the cover, and blank sheets inside. This is the part where your guests write a sweet, funny, or thoughtful note to the host and the little peanut before he comes out to the world. Be sure to place this scrapbook on a desk near the entrance, so there’s no way you can miss this important part of the event. This little scrapbook gives the mama something to read and smile about – and maybe have the little bub check it out someday, too! So there you have it my friends – my super awesome elephant baby shower for a boy party ideas with fool-proof tips and tricks. Let me know how your party ends up and show pictures, okay? Would really love to see your own creation, and I’m 100% sure it’ll be a blast!